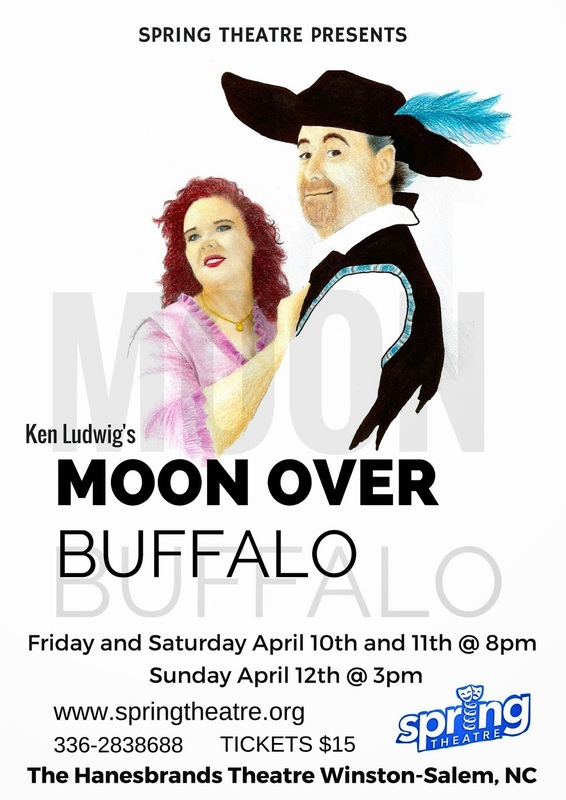 "Spring Theatre proudly presents- Ken Ludwig’s comedy Moon Over Buffalo. The plot revolves around Charlotte and George Hay, who are on tour in Buffalo in 1953 with a repertory consisting of Cyrano de Bergerac "revised, one nostril version" and Noel Coward's Private Lives, when they receive word that they might just have one last shot at stardom: Frank Capra is coming to town to see their matinee. The show is directed by Rob Taylor and features Mark Flora as George and Jean Wentz as Charlotte. Also in the show are community theatre favorites Sheri Masters, Chris Swaim, Linda Minney, Brandon Lloyd Hicks, Sara Butner and Eric Dowdy. Spring Theatre founder and artistic director Erinn Diaz says this is the first community adult production Spring Theatre has produced, but there will be many more. The organization generally focuses their energies on education-based theatre for 1st-12th grade students, providing professional performance opportunities and classes for youth. The show is performed with permission from Samuel French. Showing April 11th at 8pm, April 12th at 8pm and April 13th at 2pm. If you would like more information about this show, please contact Spring Theatre at 336.283.8688 or email at info@springtheatre.org."